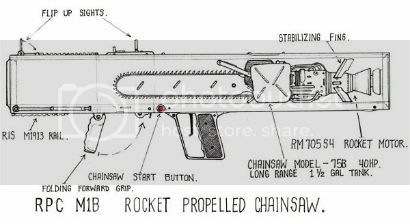 The rocket-propelled chainsaw launcher. Which seems like a terribly logical way to avoid second-hand smoke if you’re ever hunting a zombie Audrey Hepburn. Via technabob, knows why this could never work. And it starts with there being no such thing as a “rocket motor”. I’m willing to suspend disbelief only ’cause the concept is so much splattery fun! Designed right, I’d give it a decent accuracy around 50-100 yards. A rifle would shoot further and cost less, but it wouldn’t be nearly as much fun! I could see this being the BFG of some bad B apocalyptic zombie flick soon. OK, I have to nerd out in protest here a bit. Launching a chainsaw, fine. But wouldn’t you need to shoot it out with some rotation along the pitch axis, so that when it impacts, the sawing action is maximized? The way this thing is designed, the chainsaw would just impact the zombie with the hope that it has enough forward-facing force that it stabs into the zombie meat. And to Ratpukin’s point, not sure heat seeking would work. Zombies are cold-blooded, aren’t they? just saying, but there is such a thing as a rocket motor. Google it. Thousands of people do model rocketry as a hobby. However, I’m not sure a chainsaw would work out…. How about a bag full of ninja stars?